The Kegco XCK-2448S Commercial Kegerator is the ideal beer dispenser for small pubs, bars, restaurants and events. It's interior is big enough to hold two full-size kegs or a combination of smaller kegs. Forced air refrigeration keeps the beer in the kegs ice cold and blowers route the cool air into the beer tower to ensure not a drop is wasted. This beer dispenser includes two heavy duty adjustable shelves, providing the ultimate in versatility. You can store cans and bottles or keep mugs frosty on one side while dispensing multiple 5 gallon kegs from the other side! A built-in drip tray that routes to an external drain makes daily maintenance a breeze. The XCK-2448S is ruggedly built to withstand the rigors of commercial use. It features sturdy construction with an attractive stainless steel exterior. The interior walls and ceiling are made of stainless steel and a rubber floor mat reduces the shock of the heavy kegs on the stainless steel floor. An internal light conveniently illuminates the cabinet to make adjustments to your dispense system effortless. 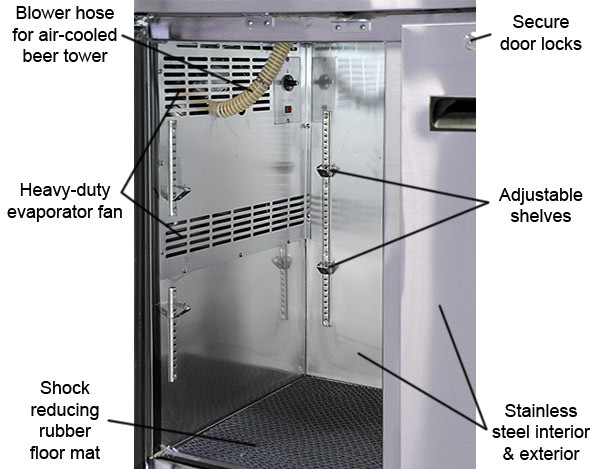 Hoses inside the cabinet that direct cool air into the draft arm and drain beer from the drip tray to an external drain are efficiently tucked out of the way. The keg cooler is designed for built-in or freestanding use, so the cooling unit is accessible from the front of the kegerator to make servicing the system easy. This kegerator can fit two Full Size or Pony Kegs, up to three Quarter Slim Kegs, and up to seven 5 gallon kegs. 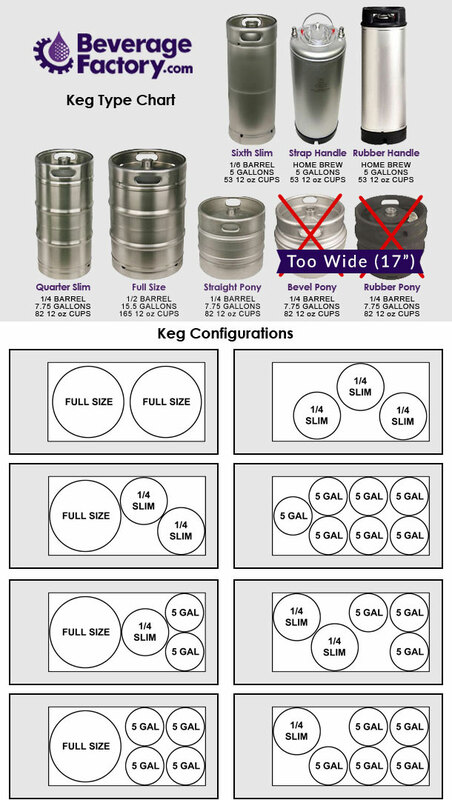 View the Features tab for possible keg configurations. Due to the versatility of the storage area inside the kegerator, we have set up custom addons below for you to customize your dispense system. If your beer distributor will be providing your dispense kit, simply choose the tower option that works for you. Please Note: The doors of this unit open to 16.5" wide. Bevel or Rubber Kegs that are 17" wide in the middle will not fit. These are commonly used by Coors and Miller Brewing Companies. 25% More Energy Efficient Design Saves You Money Each Month! Minimum Ambient Temperature: The lowest temperature you want to store your kegs at. The unit does not have a heater, so if the ambient temperature is lower than the set temperature, the internal temperature will match the external temperature. Some configurations require external tank mount.